When Brad awakens with this question on his lips but his friend Miranda on his mind, a sense of unease fills him. When he finds she isn’t home, and a strange visitor is outside her house looking for a missing pocketwatch, Brad knows something is amiss. 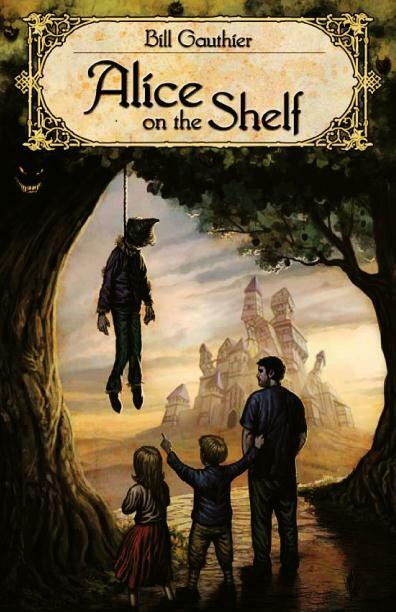 Alice on the Shelf is a novella that means a lot to me for several reasons. Perhaps someday I’ll go into the genesis of the story and the novella, but here I just want to mention that the novella has an unofficial soundtrack. In the years since 2004, in the various rewrites I would do, I would often go back to this soundtrack but also listen to other music as well. Some of the songs listed above makes me wince but it did the job. Obviously. Missy woke up excited. The Peter Rabbit clock on the wall said it was past the time she normally woke up for school. The wind outside howled and moaned and, thinking about the night before when the snowstorm began, Missy jumped out of bed. Giant snowflakes streamed past her window. Missy threw on longjohns, jeans, a turtleneck shirt, and a sweater. She brushed her teeth and brushed out her long, raven black hair. On the kitchen table was a note her mother had left before going to work. to be with a friend. Things are SCARY. Missy wolfed down a bowl of Count Chocula cereal and threw on her snowboots and coat. Things are SCARY. Mommy had been talking about the baby who’d gone missing from the lady on the first floor yesterday. The police had been at their apartment building and everything last night, asking everyone if they’d seen anything. Of course, no one had. Missy called Kathy Chambers, her best friend, and told Kathy she’d meet her at the outside back door. A few minutes later, they met. “Did the police talk to you?” Kathy asked. Missy nodded as if that explained everything. They worked together to push open the back door against a snowdrift. Wind slashed at their faces as they walked through the snow, into the small yard. The snow was six inches high and counting. “Whattaya wanna do?” Kathy asked. They trundled through the snow and howling, biting wind. A wooden fence across from the building blocked off a vacant lot. Missy tried to push a loose plank out of the way. Kathy helped Missy push the plank open and they squeezed into the vacant lot. Snow covered old, abandoned furniture and trash. The girls went to a shed and opened the door. Peeling blood red paint sprinkled on the virgin white snow. “The wind sounds funny here,” Kathy said. “That’s ’cause it’s between buildings,” Missy said. Missy pushed aside an old, rusted trashcan. “Is it still there?” Kathy asked. “Yep,” Missy said and pulled out a black garbage bag. “Okay,” Missy said and pulled out the little baby they’d stolen from the lady on the first floor. The baby had turned blue overnight, his eyes had frosted white, and icicles hung from his chin and nose. And the girls began playing house.